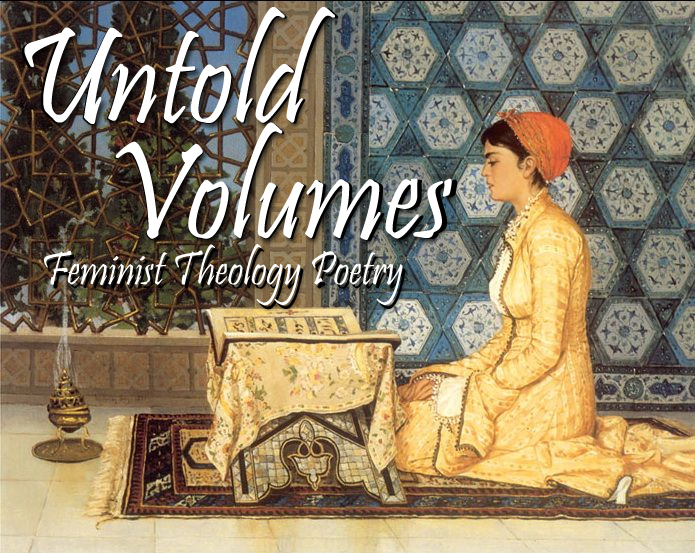 Submit your poetry to Christian Feminism Today’s feminist theology poetry series, Untold Volumes. Our second call for poems is now open through August 31, 2018. No simultaneous submissions, but we endeavor to notify for this round by October 15. Click here for the submission form. Poems considering aspects of Christianity, other faith traditions, or an interfaith approach are welcome. Send us your revisionism and remembrance, celebrations and speculations, doubts, fury, psalms, midrash, epistles, orisons, and any other poetic explorations of feminist religious thought. Both traditional and experimental forms of poetry are welcome. We have a preference for poems willing to ask difficult questions and engage with challenges from both theology and contemporary religious practice. Poems should be original works that have not been previously published. If selected, poets grant CFT non-exclusive rights to publish poems on the CFT website and in an anthology. All other rights revert to the poet. Prospective poets may submit 1-3 poems to poetry editor, Elisabeth Mehl Greene via Google form. Please do not include your name in the text of documents submitted. Preferred formats are Word docs and PDFs for text-only poetry and 300 dpi JPGs for graphic poetry. Read the Untold Volumes About page. If you have any questions, email: cftpoetry [at] eewc [dot] com.